The financial collapse of 2008 taught many of us what it looks and feels like to have our retirement savings cut in half. Many of us said, "Never again!" So where can the average person put their money where they can have more stability, but still get better returns than a savings account? Rental real estate is one way, but what if you already work too many hours and aren't handy around the house? And what about those horror stories about unclogging toilets at 3 a.m.? 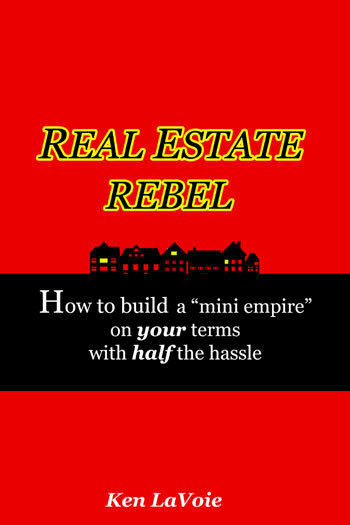 In Real Estate Rebel, Author & investor Ken LaVoie lays out a number of strategies that can work for nearly anyone. Single family homes, duplexes, multi-family buildings and syndication. He also reveals some unique money and debt management techniques that can make you richer without doing any extra work. Ken's wife & partner Deb lays out her tenant placement systems, which have resulted in 99% long-term occupancy and the joy of having their buildings full of respectable "class act" tenants. Ken went from no real estate experience to more than fifty units in three years. In doing so, he created systems to manage the day-to-day operations with ease & automation. He sought out and followed a lot of great advice, but also made some spectacular mistakes, which he identifies so you won't have to repeat them. Ken is an ardent student of the "80/20 Rule" which states that 80% of our results tend come from about 20% of our efforts. And that's what this book is really about...Having all the success with half the hassle.